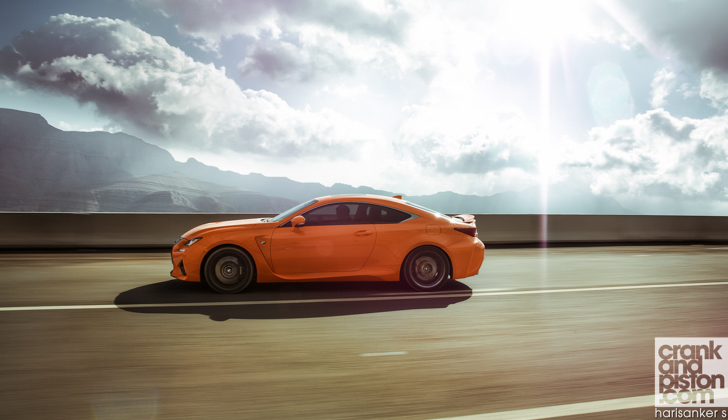 Does the follow-up to the ISF and LFA really have what it takes to be a game changer? Why my enthusiasm for a sports coupe with barely 100 clicks on the clock you may be wondering? Several reasons, retort I. For starters, the new ‘Radical Coupe’ F joins the ISF and the half-lunatic LFA supercar on Lexus’ F performance branch, meaning (presumably) better speed, better handling, better composure, and better…well, pretty much everything over the RC base model. A quick glance at the specsheet hints at such, with more driver assistance systems bolted onto the premium Japanese model than you could waggle the proverbial stick at: Torque Vectoring Differential (TVD) distributes those pound feet across the rear axle for improved traction through and out of corners; the speed-activated rear wing moderates downforce at speed; the eight-speed Sports Direct Shoft (SDS) feeds power to the rear wheels; and various other abbreviated systems of witchcraft are designed to make the RC F go very quickly, very easily. And there’s more. Pry past the power dome and you’ll find essentially the same 5-litre V8 found in the ISF albeit with 54bhp more, the RC F churning out 471bhp and 389lb ft of torque (from a broader arc of the rev range) for a 4.5 second 0-100kph time and a 270kph top speed. 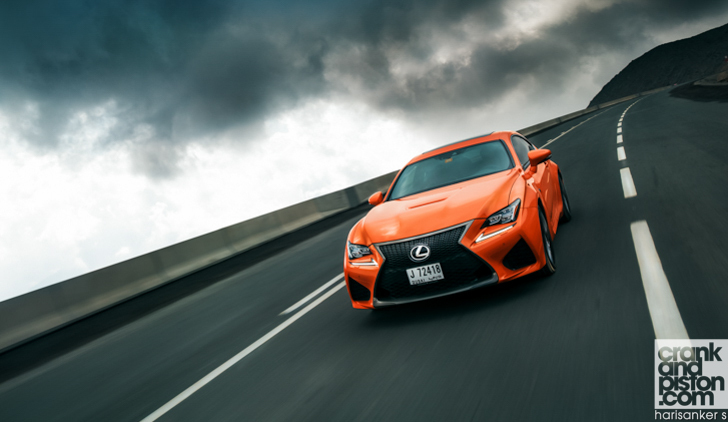 What have at our clawing mitts today then is access to the most powerful V8 performance car every produced by Lexus. Excellent, wonderful, marvellous, but even this has not got me champing at the snaffle bit. What has really tweaked my interest is that the RC F is looking to take on the BMW M4, and beat it. What we have here then is more than a very orange, very carbon fibre panelled sports car. What we have is a potential game changer. Looks-wise, it’s a good start for the aggressively designed RC F, with power dome, slick headlights, indicator ‘ticks’ and a ma-hoosive front grille about as subtle as a slap across the mouth. Throw in some nifty 19-inch multi-spoke alloys, a taillip spoiler and some enormous wheel arch grooves (complete with obligatory ‘F’ emblem), and is just as effective. 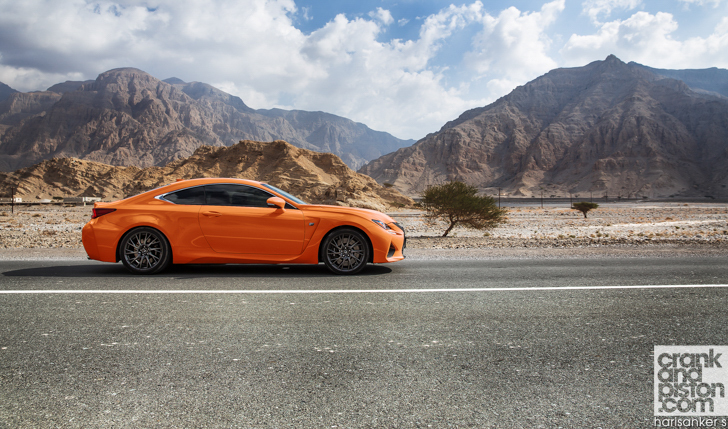 I was hoping I could stall a little longer because, truth be told, my second drive in the Lexus RC F is, once again, a little disappointing. Take the handling for instance. Grip from the front wheels is beyond ridiculous, and a super stiff chassis means that bodyroll and understeer through even the tighter turns exists only in the imagination, allowing me to keep the RC F’s hooter from snapping loose. All well and good, but there’s not as much feel in the steering as I’d like, a power-steering taking more control away from the driver for the sake of composure and thus leaving me a little disconnected from the front wheels. I’m hitting the apexes and not skidding uncontrollably into the undergrowth, but it’s drive that’s not yet grabbing me by the cajones. Which is probably an unfair comment, because a low centre of gravity, little bodyroll and a super stiff chassis means composure through the turns in the RC F is superb. The V8 is another quandary. Pull is impressive, the low rumble from the exhausts becoming a more energetic (nee louder) boom as we scythe past 4000rpm, and with very little lag, acceleration is impressively linear. None of this turbocharged garishness for Lexus, no no. Once again though the joie de vivre is difficult to find in the most performance Lexus V8 ever developed. I’d expected violence, or pick-up to be raucous at the very least. But like the steering, everything feels very composed. Very easy, thanks in no small part to the excellent eight-speed shift transmission. And very restrained. 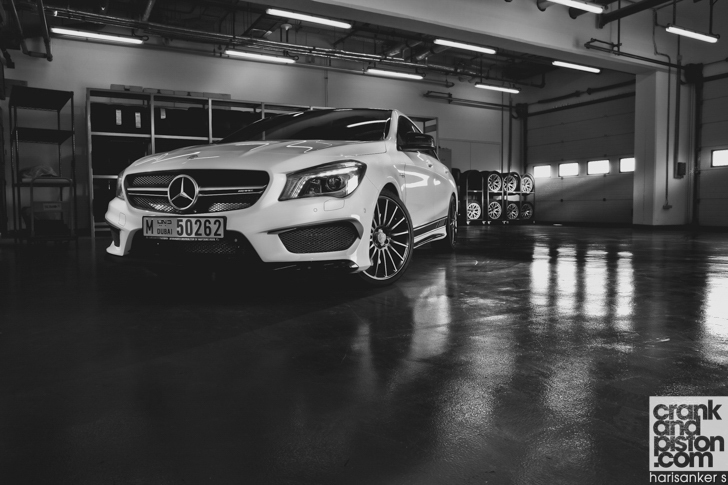 Once again, we cast our eye over those driver assistance systems for culpability. Though my drive goes from Sport to Sport+ quickly, there’s precious few extra fireworks even with heightened throttle response and speedier gear changes. Time and again, when they threaten to break traction, the rear wheels are brought back into line by the Vehicle Dynamics Integrated Management (that’s Japanese for ‘traction control’), rather knackering any thoughts you might have for lairiness. Even at the wheel, I can feel ‘the machine’ doing most of the work for me. It’s very clever and impressive, but does leave me feeling a little cold and disconnected from the drive. 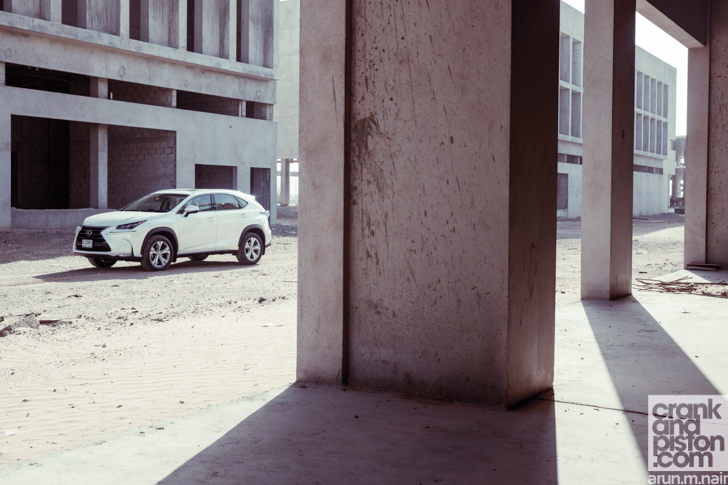 It’s disappointing, because with beautiful composure, an awesome soundtrack, a stellar gearbox and a superb design, Lexus truly has built something very special. But special enough to take on the BMW M4 and win? I’m not so sure.